Dry skin solutions. You name it, we’ve probably tried it. Despite having chronically dry and often itchy skin, my daughter has yet to find a product to commit to. Imagine my delight when she began using Manuka Honey Skin Cream from the Eczema Company eagerly and independently. I’ve been consistently surprised by how much the smells and textures of different lotions matter to my daughter. She wants a dry skin solution, but she doesn’t want it to smell strange (like strong essential oils) or give her a sticky feeling. We have tried multiple solutions and something always held her back from keeping with them. 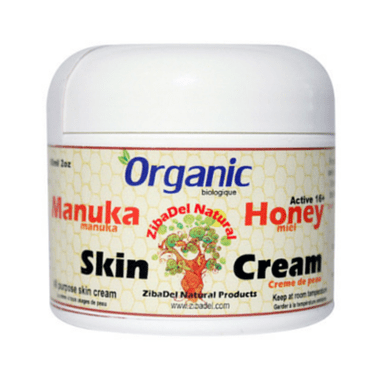 What makes Manuka Honey Skin Cream different? A sweet, appealing honey smell with non of the medicinal odor found in other natural skin creams. The oil base of this cream makes it rub on easily and soothe chapped skin. Manuka Honey Skin Cream doesn’t leave a white or thick residue on your hands. Nourishes dry skin in a gentle, soothing way that doesn’t burn or irritate. When used daily, this cream provides a barrier against dryness. Can be used to treat open wounds. 10x more potent than tea tree oil, without the potent smell. Hand crafted and HMO free. My daughter isn’t the only one who deals with dry, sensitive skin. My family is sensitive to scents and dyes in traditional detergents. The Eczema Company provided us with a SmartKlean Laundry Ball to change our laundry routine. 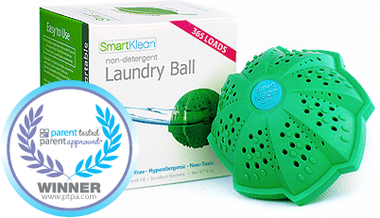 How does the SmartKlean Laundry Ball work? Everything you need is inside this fully recyclable ball. It contains 100% biodegradable ceramics and magnets that wash your clothing without adding chemicals or leaving residue behind. This eco-friendly ball is a natural laundry alternative. Natural, non-toxic, and free of harsh chemicals. One ball lasts 365 washes and cost 13 cents a load. Simply toss in a front or top loader with cold or warm water. We are used to using free and clear detergents without added scents and do not use dryer sheets, so we didn’t need to make a big adjustment to use this detergent. I really appreciated how it is eco-friendly, affordable, and easy to store – plus it cleaned our clothes without leaving residue. The packaging mentioned that the SmartKlean ball can be used with cloth diapers. I found the ball to be more effective with smaller loads of diapers. I noticed that following my regular routine meant using hot water (which is not recommended) and the diapers didn’t seem fully clean after the second or third use of the ball. I returned to my standard diaper detergent, but I would be willing to research a routine with the ball in the future. Overall, I’m very satisfied with the products I tried from The Eczema Company and I would definitely return to try more in the future. Stay tuned tomorrow for a joint giveaway from The Eczema Company and Narra Nest! Disclosure: I received product to review for this post. All opinions are my own. I love that this can be used on open wounds, my toddler just scratches and scratches. If she could communicate better we would have better luck with her, I think. Her issues come and go and there seems to be zero rhyme or reason to it :/ Yeah for kid approved stuff that is friendly, too! I like that the eczema cream doesn’t use tea tree oil, and the way you describe how it smells sounds really lovely! This is deff a must try with my daughter!! She is also not to keen on odd smells, so the fact that it smells like honey is awesome! My family also deals with dry and sensitive skin. My mom has eczema in the worst way – thick hard red dry patches. It didn’t develop as bad as it is until she was in her 50s, and I both feel sorry for her because she can’t find any product that really helps, helpless to do anything for her, and afraid because I think my skin is going to be the same when I get older. My own skin is dry and super sensitive. I completely understand how smell and texture of lotions matters to your daughter. Scents can make lotions hurt , and I honestly can’t use a lotion that has the wrong texture because it just feels weird, LOL. I have tried hundreds of lotions and have only found a literal handful of lotions that don’t burn or break me out. Now my baby boy seems to have the same problems. I had really hoped he would have skin more like his fathers really oily nonsensitive skin, but no such luck. I would love to find a product that could work for all three generations of us. It would make a huge difference for my whole family. Both of these products sound promising, and I’m going to check out their site to see everything they carry. Thanks for the review. I love the idea that the dry skin cream doesn’t have a medicinal smell & won’t make your skin feel sticky.